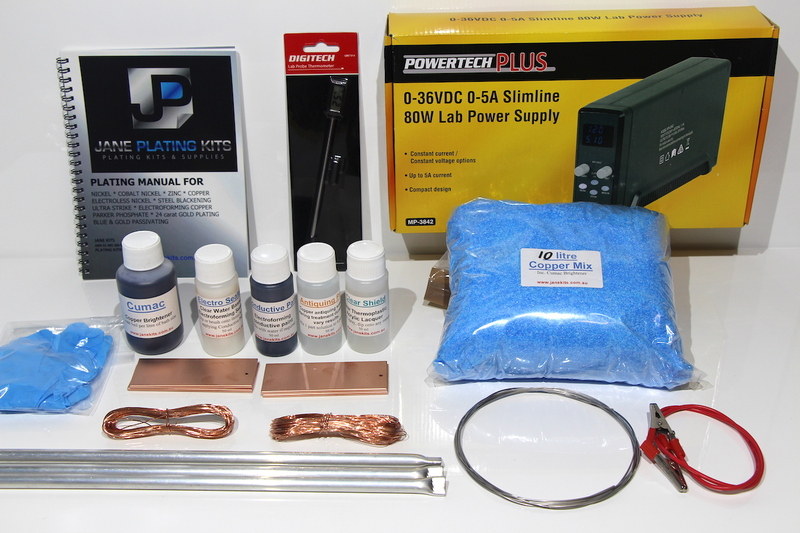 Complete 10 Litre Electroforming Copper Kit which includes all items necessary to successfully conduct your own Electroforming. Electroforming is the process of controlling the metal deposit from an anode metal, through the electrolyte solution, onto an electroconductive surface. Basically, a skin of metal is built up, over the applied Conductive Paint, into a rigid structure. This kit contains various items including; Conductive Paint for applying to non-conductive surfaces and Copper plating chemicals for applying the base metal to the conductive paint. It also includes the Antiquing Patina solution to assist in producing the ultimate patinaed look and the Clear Shield – Clear Thermoplastic Acrylic Lacquer to lock in the desired look, seal and protect the finished items. The Kit includes a laboratory type Power Supply, Plating Manual and various consumables. See a full list of Kit contents and Electroforming Copper information in the “ELECTROPLATING KITS” category on the home page.